Terry developed his special colours in watercolour in 2001. He wanted Artists quality watercolour in natural colours which are tricky to mix. Quality is important to Terry, so the paint needed to be lightfast and high in pigment. Terry's range is made here in England. Do you have problems mixing natural looking greens? 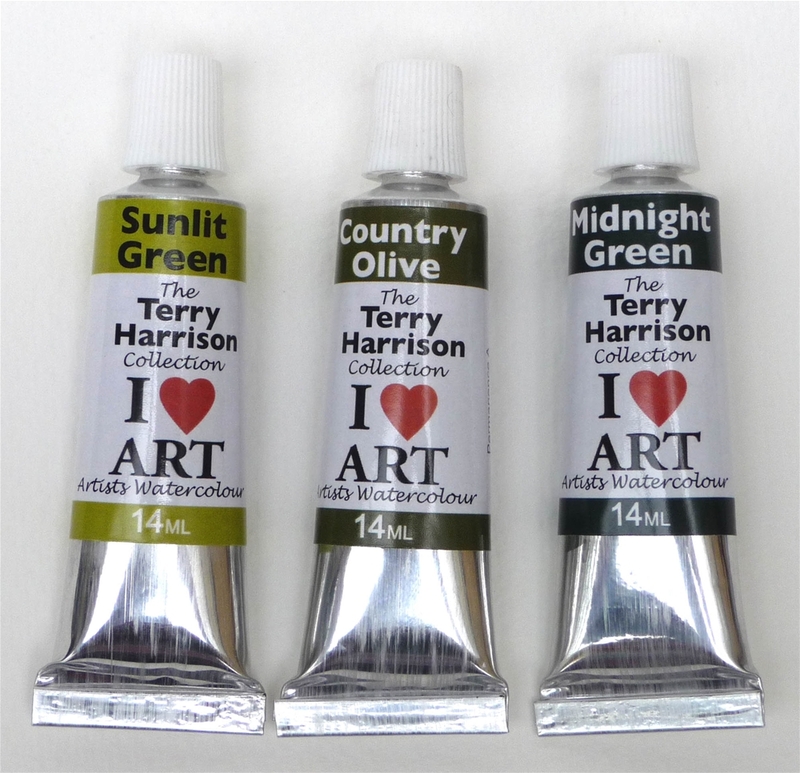 If so try Terrys ready mixed Artists Quality Watercolour Greens. Three specially blended greens, Midnight Green, Country Olive and Sunlit Green, are made exclusively for Terry which help to create a natural looking landscape - the easy way. Sunlit Green - Pigments -Copper Phthalocyanine, Monoazo, Iron Oxide. Permanence A. Semi Transparant. The 3 greens can be bough individually or slightly cheaper if you buy the set of 3 greens. Bluebell is a vibrant fresh colour ideal for painting bluebells and etherial distant hazes within a painting. It can be added to 'Shadow' to create a cool shadow colour or added to various blues or pinks to vary the bluebell haze effect. This colour proves very difficult to mix, so having it to hand ready mixed is wonderful. Pigment - Sodium Alumino, Sulphosilicate,Monazo, Titanium Dioxide. Permanence A Opaque when used at full strength. Shadow is a wonderful deep purple that creates a simple way to paint shadows and of course can be used to darken other colours, shadows are tricky but try Terrys ready mixed Artists Quality Watercolour Shadow to solve that problem. Shadow is a non granulating clean transparent colour, beautiful when applied as a thin wash over other colours to achieve the effect of a shadow. The colours underneath show through. Also wonderful for mixing rich darks, try adding Terry's Midnight Green for a fabulous almost black colour. Add Shadow to the new Permanent Wild Rose to achieve lovely maroons and burgudy colours. Pigments - Copper Phthalocyanine, Cadmium Sulphosilicate, Monoazo. Permanence A Opaque when used at full strength. Tarmac can be used for large expanses or foreground are often really difficult to make interesting, many paintings include a road surface or pathway and this colour is ideal for this. Tarmac granulates when used on rough paper which means it separates slightly showing its distinct pigments helping to create lovely textures, for example on distant hills or rocks, as well as large expanses. There is a hint of blue, purple and pink which all show when the paint granulates. It also has an opacity which helps give credibility to areas needing form. 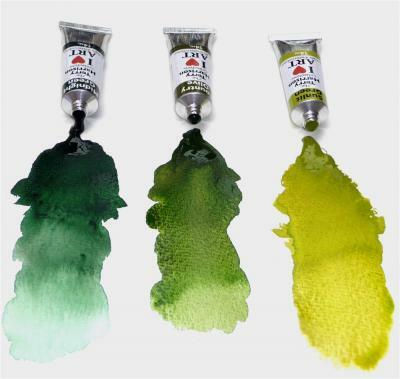 Mix it with other colours such as Bluebell or Permanent Rose to add depth to a painting. This is an Artists’ quality watercolour, which comes in a 14 ml tube. Pigment - Sodium Alumino, Sulphosilicate, Titanium Dioxide, iron Oxide, Dioxazine. Permanence A Opaque.